So far, I have made it through the week without going into school, and it's kind of killing me. I know I'll thank myself in a few weeks for enjoying this last week of break. Today I went to Target to pick up some items for my "Teacher Survival Kit". I'm sure you all have a drawer, or something where you keep personal items at work, right? I do as well, but I thought it would be kind of fun to have a bin with what I think of as essentials. It's not finished, but here's what I picked up today. Ever since I almost passed out in class a few years ago, I am very aware of my blood sugar and when it gets too low, so I have some "emergency" snacks in here. Emergency could also be interpreted as, I need some chocolate, because...chocolate. This bin is my FAVORITE! It has a dry erase tab on the outside, and they are on sale at Target right now for around $5! Contents: Mini brush, feminine products, Iced Tea K-Cups, Clorox wipes, Snack Packs, Ghirardelli minis, Lifesavers mints, Equal, French Vanilla and Caramel Macchiato creamer (we have a Keurig in the workroom), and the Crunch Girl Scout Samoa bars (yum!). I will also be adding some other things such as an extra shirt (you never know when you will spill coffee all over yourself! ), safety pins, hairties, mini deodorant, and some mini hand sanitizer. The other stuff in there (highlighters and scissors) I picked up simply because I had coupons, and I'm going to use them at school so I didn't want to forget. 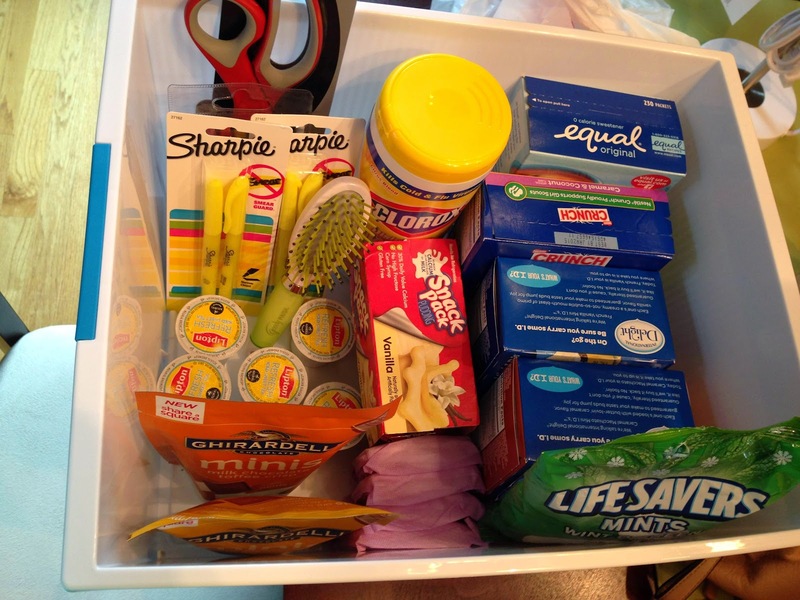 What's in your Teacher Survival Kit? I also scored ANOTHER lamp, for under $9 this time with coupons! 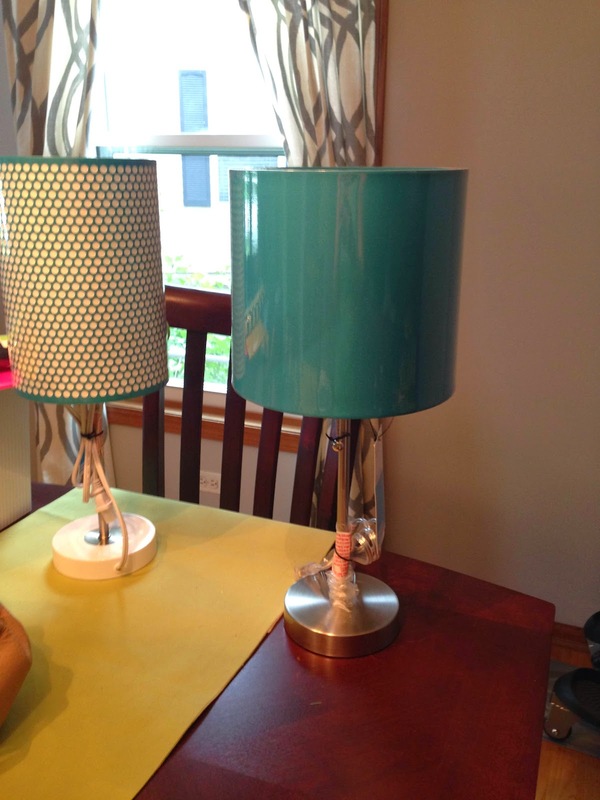 I even priced match the lamp on the left and got more money back. I'm very proud of my frugal spending this year for my classroom! 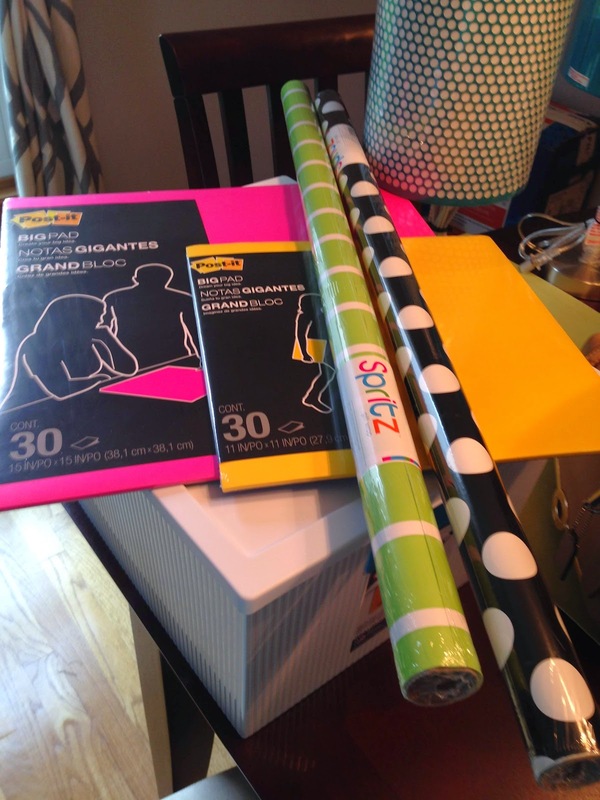 I've been fighting the urge to pick up the monster size blue Post-It's, but now I see yours! Temptation! I love that your survival kit is in a bin. I usually have those items everywhere. Aside from what you have listed, I also like to have hand lotion, gum, raisins / applesauce, spare phone charger, Advil, and eyeliner (lol). I just picked up the medium size in blue and green tonight, but I would love to get the giant ones. Let me know if you find them in a store anywhere! Nope :( Hopefully after school starts someone will have them! I am working on these for the teachers in my department.